KEANU REEVES couldn't wait to be bald. No, honestly. The thought of a smooth, shiny dome was part of the attraction for agreeing to play Neo, in the futuristic cyber-thriller, The Matrix. Running his purple, chipped nail-polished fingertips through his re-grown thick, spiky jet-black hair, he muses: "I started with the eyebrows. One day, I just shaved them off! It was fun." His dark, intense, almond-shaped eyes open wide: "What was most interesting was the reaction I'd get from people - really weird, man." What is even weirder is the way that The Matrix has set Keanu's career back on track, positioning him as the Arnold Schwarzenegger of the new millennium, now that his days of playing mixed-up youths, as in My Own Private Idaho, are well behind him (he's 34.). It is a career that has been built on people's reactions to his looks, although usually they just gawp in admiration. His mother, Patricia, is British, while his father is Hawaiian Chinese, a combination that has given him a beautiful body, camera-loving cheekbones and a vaguely spiritual more-than-meets-the-eye quality. We meet on a hot Californian morning at the Ritz Carlton Hotel in Pasadena, north of LA. He's padding round the ostentatious lobby in his brown loafers, and finally slides down me on a cream puffy sofa. He's wearing a figure-hugging black T-shirt and a grey designer suit, fashionably wrinkled. He is one of that group of young Hollywood stars that includes Johnny Depp. Christian Slater and the late River Phoenix. They are more beatnik than Brat Pack, much given to the quasi-mystical, crystals and such like, but with a wild, muscular streak, which in Keanu's case is manifested in his passion for monster motorbikes and his rock band, Dogstar. Air guitar may have been his instrument of choice when he played Ted in Bill and Ted's Excellent Adventure, but the real life Keanu plays bass. Keanu stayed loyal to his folk-trash combo, even when his role as the doggedly decent cop Jack Traven in Speed (opposite Sandra Bullock) first elevated him to the Hollywood 'A' List in 1993. But his dream of becoming a rock legend seldom receives any encouragement. Even lead singer Brett Domrose remarked that, "It's more of a burden to have a film star in the band." It is said that Reeves turned down an $11 million fee to appear in the Speed sequel because he preferred to tour with the band. A wise career move as it turned out, since Speed 2 was a stinker. "It's never been about the money." protests Keanu, sipping his Evian water. "I don't live a lavish lifestyle. I don't have those needs. I like my motorbikes, sure, but its always been about the work." Less wisely, he turned down the chance to act opposite Al Pacino and Robert De Niro in Heat. Why? Because he wanted to play Hamlet in a small theatre in Manitoba, Canada. By all accounts it wasn't exactly a definitive performance. "I'm an actor, not a movie star" he told TV chat show, host David Letterman. But he himself has been less than flattering about his own performances. He says he was "awful" in Dangerous Liaisons, "bad" in Francis Ford Coppola's Dracula, and "out of my depth" in Branagh's Much Ado About Nothing. Branagh himself identified Keanu's mysterious appeal when he put it this way: "I'd pay money to see Keanu Reeves in leather trousers and I think a lot of other people would too." Keanu's fans also enjoyed his spray-on wet-suit look in Kathryn Bigelow's 1991 surfing thriller, Point Break. But even his must devoted admirers had to concede that it was an error to take the role of a courier who rents out his brain for data storage in the 1995 flop Johnny Mnemonic. After all, half of Hollywood already had him marked down as empty headed, a 'vacant lot', who couldn't act his way out of a door marked 'Exit'. Women adore him, but even in this department, Keanu has seldom made the most of his God-given advantages, although his name has been linked with Sandra Bullock, Rachel Weisz, and Kate Beckinsale. He was briefly 'engaged' to Amanda de Cadenet. His current date is supposed to be his co-star in The Matrix, Carrie-Anne Moss. It's no secret that Moss recently accompanied Reeves on a four-day trip to India to watch him perform with Dogstar. But when asked a personal question about his rumoured romance, Keanu responds by pulling at tufts of his hair and rolling up his sleeves, as if buying thinking time. After squirming like a schoolboy, he politely replies: "No, we're just very close friends." Though he has been voted one of the sexiest men alive, is worth around $15 million and can command $8 million per movie, his preferred style of dress is woolly hats and dilapidated jeans, and if he took you out for a date (well, you can dream) he wouldn't be able to ask you back home for a coffee. Although he now claims, to have "digs in LA", he has spent years living out of a suitcase in hotels. 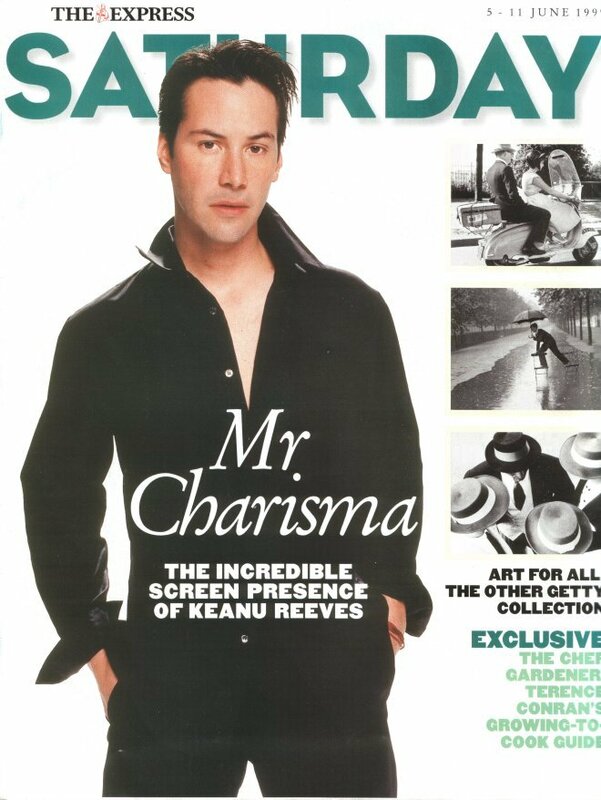 Nudging 35, Keanu Reeves looked in danger of becoming an interesting Hollywood curiosity. If it was a self-destruct mechanism, he has almost perfected it several times in one of his near-fatal motorbike crashes which have sent him flying across Sunset Boulevard, and have left him scarred, limping and without a spleen. But then, against the odds, came The Matrix. Produced by Joel Silver (whose credits include Lethal Weapon and Die Hard), The Matrix took £31 million at American box offices in just two days. It was cinema's biggest ever Easter weekend total. It seems Keanu Reeves isn't so dim after all. The film, which blurs the boundaries between movie and computer game, tells of a sinister society in which computers control and feed off human tissue by placing people in a virtual 20th-century world. It's a human farm where everyone is headed for the slaughterhouse. Neo (Reeves) is a hacker who joins a band of rebels fighting against the machine. Laurence Fishburne is Morpheus, Neo's mentor, and Carrie-Anne Moss, a former model, plays Trinity, his love interest. The special effects are phenomenal, but by no means is all the action computer simulated. Reeves, no stranger to daredevil motorcycling stunts, learned to walk up walls and perform back flips and somersaults. He beams: "Laurence and I had to swing on wires and fly into each other. We had a little head bumping experience and a few concussed moments, but they made it look like magic in the editing room." "There were martial arts experts all over the shop. They would tell us: 'No pain, no gain'. We would be stretching and practising kung-foolishness from nine in the morning to four in the afternoon. We'd even watch martial arts movies from Hong Kong in our lunch breaks. We lived, breathed, ate and slept martial arts." Transformed into Hollywood's top action man, Keanu may at last be able to throw off the image of the confused teenager that he's played both on and off screen for a very long time. His own upbringing was confusing enough, although he has remained close to his mother, Patricia, and his younger sister, Kim, who has battled against leukaemia since the mid-Nineties. Keanu was born in Beirut, but his parents moved to Australia where his father Samuel left the family. He had a drug problem and is now serving a 10-year sentence for possessing cocaine and heroin. Keanu's mother remarried twice and the family moved from New York to Toronto. Patricia earned money sewing stage costumes for rock stars such as Aerosmith and Alice Cooper (who used to babysit when Patricia went out for the evening). Keanu was dyslexic at school, and failed most subjects, though he says he enjoyed Latin. He was brilliant at ice hockey and was known as The Wall. The acting bug set in during his senior years at high school, and his move to Hollywood was an instinctive act rather than a well-planned strategy. "I jumped into this thing," he explains, "without an ultimate goal." One obvious factor which stood him out from other wannabes was his unusual name, which means 'cool breeze over the mountains' in Hawaiian. Keanu remembers the problems, his name caused in the early days. "My manager at the time told me nobody would cast me because I sounded too ethnic and this would limit my roles. So, I went through this terrible phrase of using KC Reeves (Charles is his middle name) which lasted for about three weeks. As soon as I met the casting agents, I'd tell them my name was Keanu anyway." At the end of our interview, I pluck up the courage to ask him something that had been bothering me since the start: why is one of the sexiest men alive wearing purple nail varnish? Released from the burden of answering questions about his romantic interests, his present accommodation and his emotional state, Keanu lets out a big grin. "Oh, the old nail polish. Joel Silver is hating me right now. He's like: 'You're not going to talk about the movie. She's going to ask about the nails!" Satisfied that he's answered this question at least, he takes a slow sip of ice-water and waits to battle another taxing inquiry. It takes me a moment to realise that I'm none the wiser about the nail polish. Weird, man, just weird. The Matrix is on general release from June 11.